We won't get back into the "New Fenway Park" replicate debate—it's a loser as long as the NOG (New Ownership Group) stays in town. But, we can vicariously lust after the new (privately-financed) stadium being proposed by the Oakland Athletics. 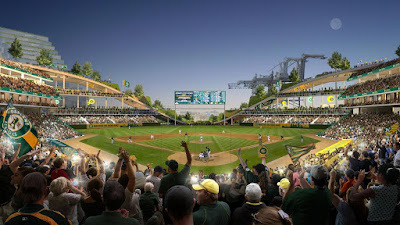 As the team puts it, the new, intimate 'Ballpark at Howard Terminal' will have a : "total capacity of around 34,000 - including fixed seats and general admission experience areas - to be arranged in the closest configuration possible to home plate, along with an elevated park that wraps and frames the bowl, coming down to meet the waterfront. The square block of the ballpark district will sit neatly within the extended urban fabric of Oakland, transforming the ballpark's concourses into street, and concessions into restaurants. Diverse programming embedded within and around the ballpark will ensure the ballpark, and the park that sits atop it, are active on game days and non-game days alike. The privately financed ballpark will anchor a new, vibrant waterfront district that will feature a mix of housing, including affordable housing, offices, restaurants, retail, small business space, parks and public gathering spaces." The part we like the best is the image of the looming 'container cranes' in right-field that so define the Oakland waterfront. This place looks amazing. Let's hope they can pull it all together and get it built—because the Oakland "Mausoleum" they play in now is just plain unacceptable for major league baseball.